Lates calcarifer, commonly known as the Asian sea bass or giant perch, is known as barramundi in Australia and it has got many local names in our country such as Kalanchi in Kerala, Koduvai in Tamil Nadu etc. 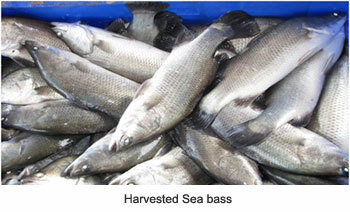 It is an economically important food fish in Indo-Pacific countries and It is a high value fish cultured in our country . It belongs to the Family Centropomidae. It can live, grow, and mature in freshwater or brackish water but spawns in the sea. It is euryhaline thus it can survive from 0 ppt (freshwater) to 35 ppt (seawater) salinity which makes it a most suitable candidate species for culture In both marine as well as fresh water.The intensive production of this species through cage and open water culture is now being developed and practiced in our country because of its quality taste, white meat and high export market value.